Soulful original blues/rock with virtuoso harmonica and vocals, featuring killer guitar players. Renowned for his incendiary harmonica work on Johnny Winter's "White Hot & Blue" LP, Pat Ramsey has been called "a harp player's harp player". "Ask Harmonica buffs which Johnny Winter album is their favorite, and I'll lay odds that "White Hot & Blue" gets cited most often. Pat Ramsey's harp work on that album is the reason why. Now Pat has released his own project, the aptly named "It's About Time"
"It's About Time is one of the most exciting albums I have heard in ages. Two months later, I have yet to pull it out of my tape deck." 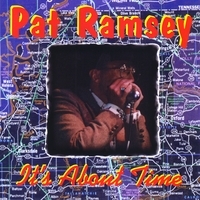 "Pat Ramsey's new CD, It's About Time, smacks you between the ears. When the testosterone is alternately poweringthe harp and the guitar, this is pretty exciting fare." "It's About Time has some of the best harp and vocals you'll hear anywhere." "Variety aplenty and all done well... seasoned and on target... harp sparks flying throughout." "Pat has fabulous tone, as big as the Grand Canyon." "Pat can blow a harp as well as any of the best I have seen, and combined with his very dynamic, soulful, bluesy vocals, his performances are always memorable." Born in Shreveport, Louisiana in 1953, Pat Ramsey began playing the harmonica at the age of 17. After a couple of years honing his chops hitchhiking all over the United States, Pat joined the Bunny Brooks Band in Denver (an offshoot of the 60’s band “Jam Factory”) in 1973. In late 1978, Pat met Butch Trucks of Allman Brothers fame. After a couple of sizzling jams in Colorado with Butch and his band, "Trucks", Pat signed on, and made the long move to Tallahassee, Florida. When the Allman Brothers Band reunited in 1979, Butch disbanded Trucks and introduced Pat to a local Tallahassee band called Crosscut Saw. Julien Kasper, a seventeen-year-old guitar prodigy and Pat became partners and the band quickly thinned from seven to four when they decided to take the band on the road. In the next five years, Pat and Crosscut Saw played every juke joint and roadhouse from Key West to Connecticut. In 1985, the Pat Ramsey Band was formed when Julien opted to study jazz at the graduate level. They opened for many notables as well, including a seven-city tour of Florida (in 1987) with his old friend Johnny Winter. Pat moved to Sarasota, Florida, in 1991, to play with his friend from the Freddie King Band, guitarist Greg Poulos. The Poulos-Ramsey Band was born. Within months they were opening for acts like Charlie Musslewhite, Solomon Burke, Albert Collins, Ronnie Earl, James Cotton and Pinetop Jenkins. Jerry Wexler hailed them as “Sarasota’s ONLY Blues Band!” Two years later, they were ready to make the jump to Memphis, Tennessee. Alas, while Pat was busy scouting gigs in Memphis, tragedy struck Greg’s family in Florida, bringing a premature end to this endeavor. A new face in a new city, Pat began dealing Craps in a casino on the muddy Mississippi River, an hour south of Memphis. Jamming on Beale Street on his days off, Pat was quickly accepted by local musicians and was hired to play at the Blues Café as part of the house band. Pat Ramsey left us on Monday, November 17, 2008 at 3:11 pm, ET. "Although you may no longer see the songbird, if you listen with your heart, you can still hear his song"
I heard Pat Ramsey recently on B.B. King's Bluesville on XM radio. Pat is an absolutely awesome harp player. His albums were out of print because of his recent demise. Then along comes CD Baby. Thanks CD Baby! By the way the Leidel /Longchamps Band is great also. I've been following Harry Leidel's career for years. This album also rocks!